Can a strong fourth quarter get the rugged work wear retailer back on track? 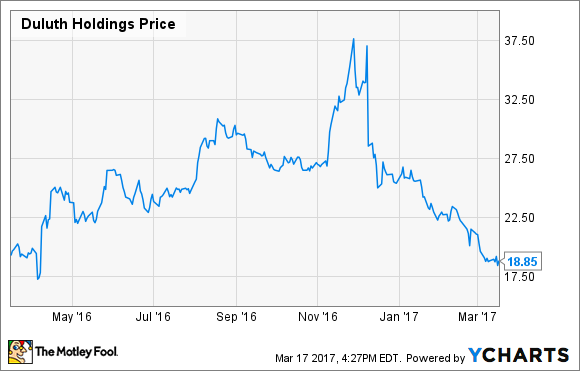 Since reporting its third quarter earnings back in December, shares of clothing and gear retailer Duluth Holdings (NASDAQ:DLTH) have been in a tailspin, falling from around $37 to less than $19 today -- a 50% decline. The main culprit? Duluth reported sales that fell short of expectations and simultaneously reduced its full-year fiscal 2016 guidance to boot. Additionally, the retail sector in general is struggling mightily. Is the company's growth story broken, or will its long-term expansion story remain intact? Here are three key items to watch when Duluth reports on March 21. Can sales return to healthy growth? The weather from September through November 2016 was the warmest on record since 1950 for dozens of cities from the Northeast to the West. At King of Prussia's grand opening on October 21, it was almost 80 degrees, and that certainly does not signal to customers that it is time to buy fleece and lined pants. The good news is that early in December, the weather had begun to turn much colder, and Duluth had already begun to see improvements. Pugliese goes on to note that while the company did enjoy solid Black Friday and Cyber Monday sales, it wasn't enough to make up for the softness heading into November, so the company lowered its guidance to a range it feels comfortable hitting with "a high degree of confidence". The company's revised guidance calls for full-year 2016 sales in the range of $360 million to $370 million, which reflects 20% annual growth at the midpoint. If Duluth can achieve full-year total sales of at least $365 million, it would help validate the idea that the third quarter softness was a one-time event and that Duluth's longer-term growth trajectory is still on target. As the company continues to open stores, retail sales have arguably become its most important growth driver. Though its online sales are still increasing, its stores will need to help carry the load to achieve the rates of overall growth that Duluth is targeting. Management stated that during the problematic period of warmer weather, its retail sales actually held up better than its direct (online and catalog) sales. In the third quarter of 2015, retail sales were only 15.8% of the top line. A year later, they had grown to 22%, and management's long-term target is for its retail operations to contribute 30% to 35% of net sales. In addition to the reported sales mix, keep an eye on the corresponding rates of growth. In the most recent quarter, Duluth experienced 68% growth in retail sales compared to just 12% growth in direct. Until Duluth begins releasing store-level sales data, we'll have to settle for seeing an increasing proportion of retail sales coupled with a high rate of growth. How quickly can Duluth open new stores? Duluth is still in the early stages of building out its physical retail presence, operating just 17 stores as of this writing. However, the company has said it intends to significantly increase its rate of expansion and has already identified a total of 100 potential locations nationwide. In 2017, Duluth plans to open eight to 10 new stores, focusing on the eastern half of the U.S. If the company ends up committing to the higher end of that range -- or even better, increasing it -- it would signal management's confidence in the health of the business and its long-term opportunities. For the sake of comparison, the company opened nine stores in 2016. If we take management at its word, we ought to see more stores opened this year than last. Duluth is scheduled to report its fourth quarter and full-year 2016 earnings after the close on Tuesday. In December, management reaffirmed its long-term annual targets of 20% sales growth, 25% net income growth, and 25% adjusted EBITDA growth. We'll know soon whether Duluth's previous quarter was the beginning of a more worrisome trend or just a short-term stumble.